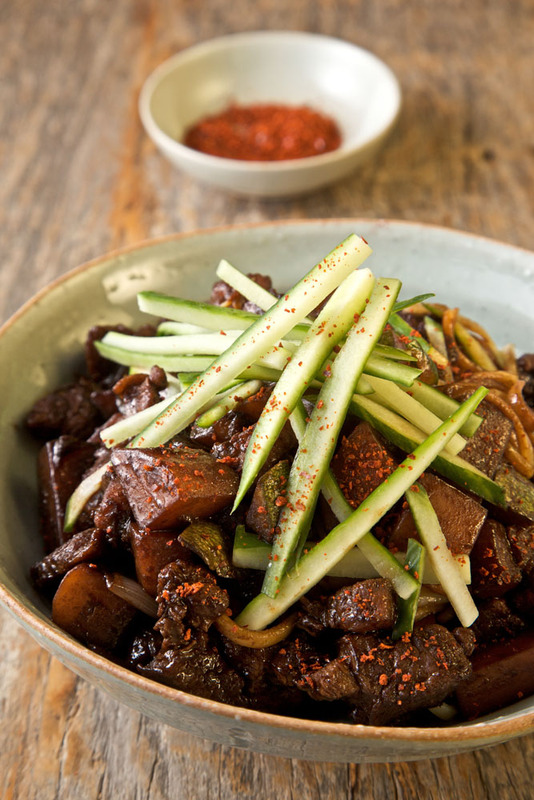 Like pizza for New Yorkers, jajangmyeon is an imported dish (the black bean paste is a Chinese ingredient) that’s become part of the Korean identity—it’s eaten everywhere, especially late at night and especially as takeout. 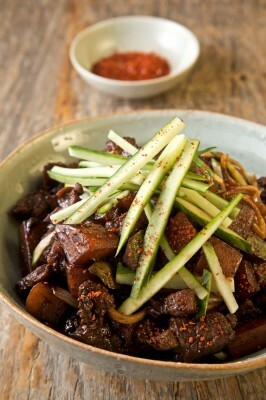 Jajangmyeon has been near and dear to my heart since I was a kid in Korea. 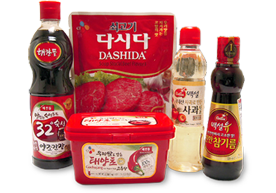 When I first returned to Korea as a grown-up, it brought back a flood of memories when I first tasted it. Now I don’t wait for a trip to Korea; I make it at home or eat it in the food court at H Mart, a chain of Korean groceries with a huge store in New Jersey. A word of caution though: Don’t get jajangmyeon on your clothes as it won’t come out. Bring a pot of salted water to a boil and cook the potatoes until just easily pierced with a knife, being careful not to overcook them, about 10 minutes. Add the zucchini and cook for 1 minute. With a slotted spoon, transfer the vegetables to a sieve or colander and rinse with cold water to stop the cooking. Add the noodles to the boiling water and cook according to the package directions. Drain and set aside. Meanwhile, heat the oil in a large nonstick skillet over high heat. Add the pork belly, season with salt and pepper, and cook, stirring now and then, until browned and crispy and all the fat is rendered, about 7 minutes. Remove the pork with a slotted spoon to a paper towel–lined plate and discard all but 2 tablespoons of the fat from the skillet. Add the onion to the skillet and cook until beginning to soften and brown around the edges, about 2 minutes. Add the potatoes and zucchini, a pinch of salt, 1/2 teaspoon black pepper, the black bean paste, 3/4 cup water, and the reserved cooked pork and stir to combine. Bring to a boil, reduce the heat to a simmer, cover, and cook for 10 minutes. Divide the cooked noodles evenly among 4 serving bowls and evenly ladle the black bean sauce over the noodles. Garnish each bowl with the cucumber and a pinch of red pepper powder.